Though many years have passed, it seems like yesterday that the world would forever be changed. This Sept 11, 2015 marks 14 years since that day that began in New York with a beyond beautiful clear September morning. In a moment the sun and clear blue sky was replaced by smoke fire and a day that would never be forgotten. After a full day of rain and the mention of rain for this day of remembrance, it was as if on cue that the skies knew not to rain upon this day of remembrance. The sun shone down revealing a beautiful day as if to say “We will never forget and we will persevere “. Reflecting back on that fateful day shock filled those near Ground Zero and spread around the world. Driving to work like any other day, I remarked to myself just how crisp and clear this September morning seemed to be. The sun could not be shining brighter, The sky was the perfect shade of blue with just a smidgen of puffy clouds hanging as if ready for a photo op. As with every day that I drove to my job the planes would fly over my car in their decent to JFK Airport. In a split second that perfect picture would forever be shattered. News came on the car radio that the North World Trade Tower was hit by a plane. My first thought “Must be a small private plane with an inexperienced pilot”. When the second plane hit we knew we were being attacked. The world was at war is what first came to mind! I walked into my office with my portable radio. I rushed home in disbelief and shock. As with other parents my first instinct was to go to my young six year old daughter’s school to find her. No one knew what was to happen next. Immediately the United States became a no flight zone. For days we would only see fighter jets flying overhead as we watched from the viewpoint of the beach on the north shore of Nassau County the smoke rise from Ground Zero. Even the stench of war from the smoke of destruction filled the air. Marking this 9/11 anniversary as a new military mother. That six year old little girl of mine that I rushed to put my arms around 14 years ago on 9/11 literally marked her twentieth birthday this year by being accepted into an elite Navy program. Although still in college she was sought out and courted by the Navy for her strong academic accomplishments and her leadership abilities. Upon graduation in two years my little girl will be entering into a job that is aimed to protect America and the world. I never imagined that I would ever be a military mom. Perhaps if 9/11 had never happened my daughter would be working with whales and dolphins as she had dreamed as a little girl. Instead she felt a calling and a need to be part of a solution to gain world peace. As my initial shock wore off we discussed the future. Popop would be proud of his great granddaughter following in his footsteps, as he proudly served himself in the Navy during World War I. It occurred to me that in this strange new twisted world perhaps the safest place for my child would be working in the Navy. With attacks by terrorists in cities around the world and terrorists bombing the Boston Marathon who knew where it was safe and where it was not. In the rain of the night before I traveled by water past the new One World Trade Center towering building proudly climbing to the sky and into the misty clouds as if in defiance of anyone who would dare attempt to attack again. The rain was cleansing as we drifted by Ground Zero looking out at the beautifully lit city. 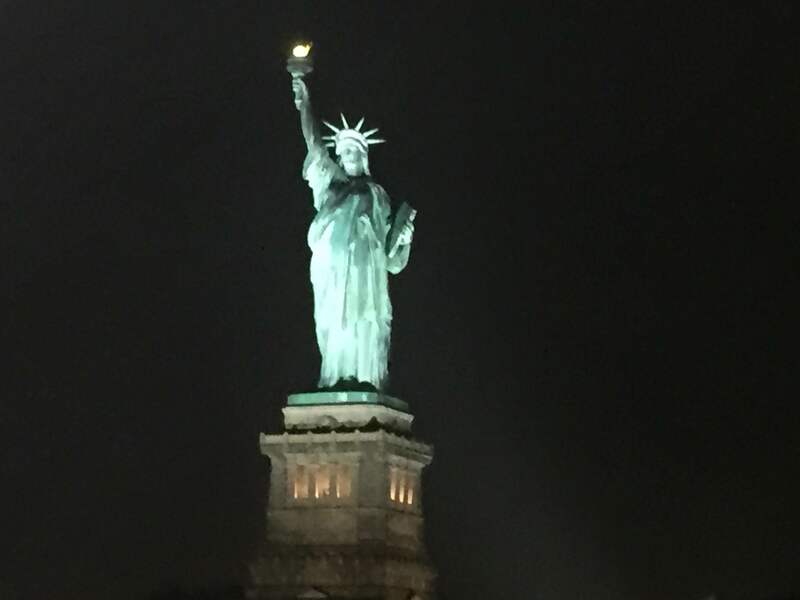 Lady Liberty stood tall in guard of the city and the country. A moment of a hush filled the boat as “America the Beautiful” played to honor the peace that the Statue of Liberty stands for. The new One World Trade Center stands tall this year newly open and welcoming to all to visit and share in remembering those lost as well as a look towards a peaceful future ahead. Along with the 9/11 memorial and the continued growth of New York City’s downtown in the wake of such tragedy, 9/11 will forever be a day that surely we will never forget. As generations move forward so will the remembrance of 9/11. Life will never be the same again as before that day. Hopefully peace for the world will be found one day and there will be no need for the word prejudice; for all people of all ethnicities, beliefs, genders and religions all bleed the same color when cut. Never be afraid to dance and to live life to help others and add peace to the world; may we never forget! Tagged 9/11, Ground Zero, how has 9/11 effected you?